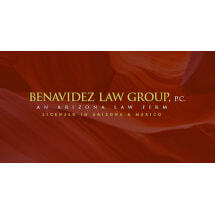 Benavidez Law Group, P.C., in Tucson is a highly respected general practice law firm representing clients throughout Southern Arizona in the areas of family law, criminal defense, immigration, estate planning, business law, real estate, government law and grant writing. Our highly skilled representation in each of these areas allows us to provide for all of our clients' legal needs under one roof. We offer clients more than 40 years of combined experience in the practice of Arizona law, and we pride ourselves on our ability to recommend comprehensive solutions to even the most complex legal problems. Clients are often surprised to learn how such areas as family law and estate planning or immigration and criminal defense can overlap. Our attorneys' extensive experience in all of these areas allows us to accommodate all of our clients’ needs without involving outside counsel. No matter what type of legal issue you may be facing, you can rely on Benavidez Law Group, P.C., to provide the meaningful and timely representation you require. We are known for our commitment to obtaining positive results and the high level of service we offer to every client we represent. We invite you to contact our Tucson office to discuss your family law, criminal defense or other legal needs with a lawyer.